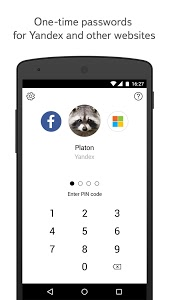 Yandex.Key is an authenticator generating one-time passwords (OTP) for Yandex, Facebook, Google, GitHub, Dropbox, Vk.com, and other services with two-factor authentication (2FA). To log in to Yandex, enter this one-time password instead of your regular password, and to sign in to other services, with your normal password. You no longer have to invent complex passwords to protect your Yandex account. There are just four digits to memorise: they’ll be used by Yandex.Key to generate a unique one-time password valid for less than a minute. Yandex.Key safeguards your account from being hacked and your personal information from being stolen. One-time passwords will be available only to you, on your mobile device. 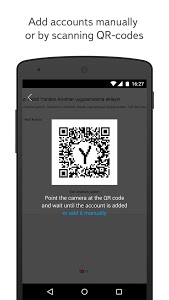 You can add accounts manually, by entering the data from the service you want to use, or automatically, by scanning a QR-code provided by this service. 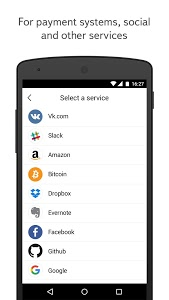 Yandex.Key doesn’t need internet connection to add accounts and generate one-time passwords, and you don't need to wait for an SMS with your password. 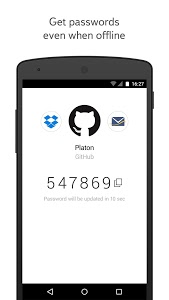 The Key can general six- and eight-digit passwords, depending on the service’s requirements. Besides, the Key can update one-time passwords at different intervals, not necessarily once in every 30 seconds (this depends on the service). 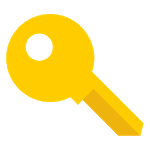 Yandex.Key supports two-factor authentication (or two-step verification) on all services using RFC 6238 and RFC 4226, except for services which only use sms. Back up the data in Yandex.Key on Yandex's servers, to use in case something happens to your device. It's secure: you backup is encrypted using a password that only you know. Problems displaying the master password screen and crashes following attempts to enter the master password. Similar to "Yandex.Key – your passwords"